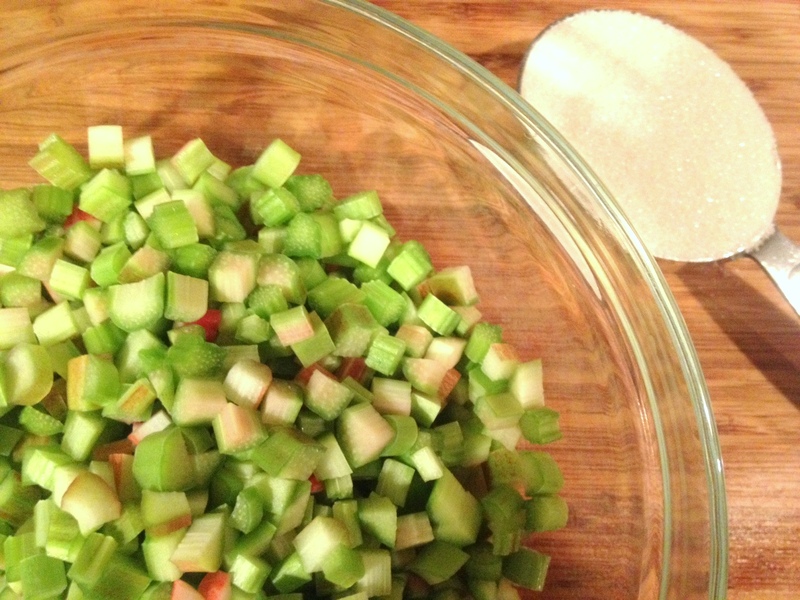 Raw Rhubarb Compote: Trim the leaves and ends from enough stalks of rhubarb to equal about 1 1/2 lbs. Slice the stalks lengthwise into 1/4″ lengths, then chop crosswise to make 1/4″ dice. Add the juice of half an orange (about 1/4 c.) and 1/2 c. sugar. Stir to combine completely, then leave out on the counter overnight (or at least 6 hours). Stir again and serve over yogurt, or transfer to fridge for longer term storage. We love to put compote on our pancakes. This looks great! I always hate rhubarb as a kid, but I am being to love it just a little. What a clever use for raw rhubarb. You’re right about the green stalks not looking so attractive when cooked, so this is a great use for them. You bright back great memories with my brother and I eating fresh rhubarb from the big patch on the farm, dipping it in bowls of sugar … Ah, childhood memories. Me neither. Emmy teaches me something new at least once a week…. I have got rhubarb coming out of my eyeballs, so I will definitely make this! One way I like to use it, which is definitely indulgent, but a great dinner party dessert is Shortbread topped with a Wedge of Triple Cream, Finished with a Rhubarb Compote, http://wp.me/puWta-cC, but I think a raw would be better like yours, so will give that a try. How long do you think it’ll keep? Wow, I’ve never tried raw rhubarb in any form, but I absolutely love cooked rhubarb… This sounds great! Interesting! I’ve never seen rhubarb eaten raw! I’ll have to give it a try! I was only recently introduced to rhubarb (a few years ago), but I must say it’s pretty delicious. Obviously I love it in pie form, I must try it raw too! Good to know! I also went the beverage route and saved the liquid from this (which I figure is like a rhubarb simple syrup) to mix with sparkling wine, but next time I’ll get some rum in the mix and try it out!